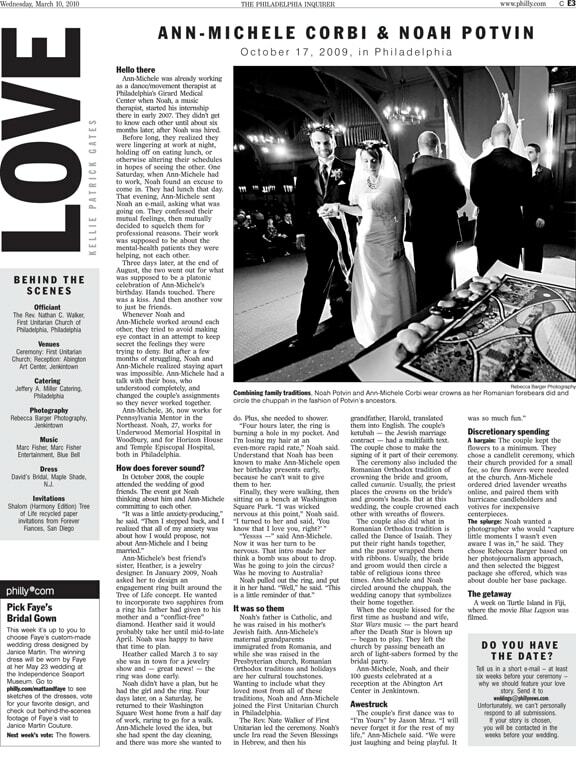 Anne-Michele Corbi & Noah Potvin, quite an interesting couple, are featured in the March 10, 2010 LOVE column by Philadelphia Inquirer writer Kellie Patrick Gates. Read their story in its entirety and see more photos that the Inquirer published at this link. To see my blog posting about their wedding day, including additional images, go to this link. Noah wanted a photographer who would “capture little moments I wasn’t even aware I was in,” he said. They chose Rebecca Barger based on her photojournalism approach and then selected the biggest package she offered. What was the best part of this for me? Well, to be truthful with you, it’s not the photography, it’s that my 82 year old mom called today to tell me she was proud of the results of how hard I work. And I don’t believe I’ll ever tire of being proud of my own daughter. For me, this is what life is all about, our families, and it sure is nice to have photographic evidence of it all…Congratulations to Ann-Michele & Noah on their nuptials, the official start of their very own family! Ann-Michele & Noah had their reception at one of my favorite places the Abington Art Center. Jeffrey Miller Catering provided a fabulous vegetarian feast (roasted portobello…yum!) for the couple and their 100 guests. Beautiful lighting and entertainment by Marc Fisher Entertainment, located nearby in Blue Bell.